More than 200 people who live near the High Acres Landfill are suing the owner of that facility, Waste Management because of what they say are ongoing noise and odor problems. That landfill straddles parts of both Perinton and Macedon, and a neighborhood group called, Fresh Air for the Eastside, along with the 215 or so people filing the suit, want Waste Management to close two sections of the landfill that the residents feel are part of the problem. Linda Shaw is one of the attorneys with Knauf Shaw LLP , the law firm which filed the suit. She says one of the problems is the volume of garbage brought in by rail every day to the landfill from New York City. "...and when these railroad cars sit on these railroad tracks going more than 350 miles from New York City, and they’re covered in plastic, when they open the plastic, the garbage smells much worse, than when local garbage was being taken into this landfill which was only three years ago." Shaw says that the problems at High Acres have gotten worse in recent years. She also contends that efforts taken by Waste Management to try and mitigate the odor problems were more of a “band aid” approach. 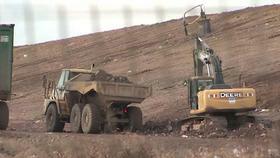 Shaw maintains that the design of the landfill was compromised, so the current problems are really not fixable. The lawsuit seeks a court order to have the amount of trash brought in by rail cut by 50 percent initially, and then see if that helps ease the problems. The lawsuit, filed in federal court, also asks for damages.